Back in 2012 this writer was in New York watching USA vs China. Two boxers stood out one from each team. From team USA it was Philadelphia’s Jesse “Hard Work” Hart, now 22-1. He lost that fight in his September title shot to Gilberto Ramirez the WBO Super middle champion. 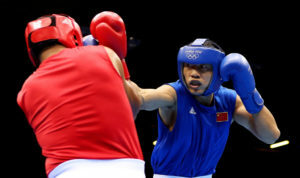 The Chinese team had a boxer I thought may have been from Mongolia but I was wrong for he was from Chifeng, China. I have seen Meng, fight professionally in Atlantic City, NJ, when he defeated Zab Judah’s brother Daniel, 24-10-3, in July of 2016, scoring a fifth round knockout. That was his 8th fight. I saw him in his third fight at Beach Haven, NJ, beat Michael Mitchell, 3-5-2, of Paterson, NJ. Mitchell defeated Wildwood’s Chuckie Mussachio, 19-3-2, in January of 2017. Meng’s first four fights were in the US then one in Puerto Rico. Then back to the US then China and when he beat Judah. In April of 2017 in his last US appearance he won all eight rounds defeating Brad Austin, 12-23, from Tennessee, right after Austin beat Greg Brady 5-1. After the Judah fight in September of 2016 Meng defeated Zura Mekereshvili, 18-5, from the country of Georgia. Meng came off the canvas twice to win an eight round majority decision. Zura now has 22 wins with 18 by KO. In Meng’s next fight which was in January of 2017 Meng won the vacant WBO Oriental light heavyweight title with a first round knockout in his first ten rounder over Russian Gasan Gasanov, 12-4-1, in April of 2017. In Meng’s next fight he returned to the US beating Austin. Next in his last fight in October he defeated Emmanuel Danso, 28-1 (23), from Ghana, winning all ten rounds in Macao as the co-feature to an IBF Female world title fight. He is now 12-0 with 7 knockouts. Meng represented China in the 2012 Olympic Games defeating a Moroccan, 17-8, then came a Brazilian that ended 17-17 and they gave it to the Brazilian. Meng fought in the 2009 and 2011 World Amateur Championships. In 2009 he was 1-1 and in 2012 he won his first three matches then losing to a boxer from KAZ named Adilbek Niyazymbetov. This brings me to my other prospect who defeated Niyazymbetov when they ended up 15-15 in the Gold Medal round of the 2012 Olympics. That fighter is Egor Mekhontsev from Asbest, Russia who is 13-0-1 as a professional with 8 knockouts. He’s a 33 year-old light heavyweight southpaw now living in Los Angeles, CA. Mekhontsev was a quarter-finalist in the 2005 World Amateur Championship going 2-1, in China. In 2009 he moved up to heavyweight and won the same tournament defeating among others the current WBO World Cruiserweight champion Oleksandr Usyk from the Ukraine, who won the 2012 Olympics defeating the boxer who defeated him in the 2008 Olympics Clemente Russo of Italy, in Milan, Italy. In 2011 Mekhontsev was a Bronze medalist as a light heavyweight in Baku, Azerbaijan, where he won his first three matches including defeating Marcus Browne of the US, 14-6, who is 20-0 (15) as a pro. Mekhontsev then beat a boxer from the Ukraine but lost to the Cuban Julio Cesar la Cruz 20-15, who won the Olympic Gold Medal in 2016, the World Amateur Championships in 2011, 2013, 2015 and 2017. Mekhontsev was the Gold Medalist in the European Amateur Championships in 2008 in the UK and in 2012 in Russia. In the 2012 final he defeated Tervel Pulev, now a cruiserweight from Bulgaria who is 6-0 (6), as a pro, and lost to Usyk in the semi-final round of the 2012 Olympics. Tervel is the older brother of Kubrat Pulev, 25-1, only losing to Wladimir Klitschko in a world title bout. Mekhontsev’s first six fights ended in knockouts with four of them in the US, one in Macao, where he stopped Thailand’s Atthaporn Jaritram, 4-0, February of 2014. Only in his first bout did he fight someone with a losing record in December of 2013. He was 6-0 in 2014 stopping boxers Dwayne Williams 5-1, Mike Mirafuentes, 2-0, Samuel Miller 28-8 and Jinner Guerrero 7-2 while decisioning Joey Vargas 17-9-1, winning 7 or 8 of the 8 rounds. In 2015 Mekhontsev was 3-0 stopping Marcelo Leandro Da Silva, 21-3 (dislocated left arm), of Brazil, Hakim Zoulikha, 21-5 of France, and Jackson Junior 17-3, of France. In 2016 he was 2-0-1 Felipe Romero, 19-10-1, of Mexico and knocking out Victor Barragan 12-9-1, then drawing in a majority decision with Alexander Johnson, 16-4, while getting a 78-74 in his favor. It was close to a year without fight with his only 2017 fight in Moscow in July. Top Rank released him two years ago. Mekhontsev’s opponents as a pro are 105-55-6.